Sydney Shop Girl: Snow Falls At SSG Manor. After the busy-ness of present shopping yesterday, it was time to settle down and chill out today. And a new sparkling from New Zealand imbibed. I love the label design of the bottle. The lounge room floor is a sea of gift wrap at my feet and wrapped presents under the window. The good cheer of the season has also extended to the cricket (for Australia). Mr SSG is in good spirits with Australia's win in the Perth test. The Australian Captain has a fractured finger but is willing himself to play the Boxing Day test. And Shane Warne. Liz appears to be calling it quits. A new scandal has broken. Some people just shouldn't be twittering. Liz, I'm in your camp on this one. The white jeans I bought because of you were hanging on the line today in silent support. Being Sunday, it was also a day of baking. Today's project were Melting Moments. There are a couple of things I like about this recipe. Firstly, the ingredients are readily available in my pantry. 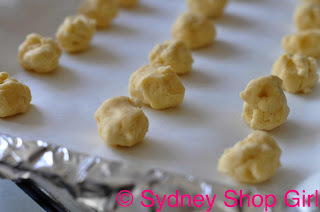 Also, becuase the recipe calls for the dough to be refrigerated before baking, it was easy to get uniformly sized cookies that held their shape when baking. 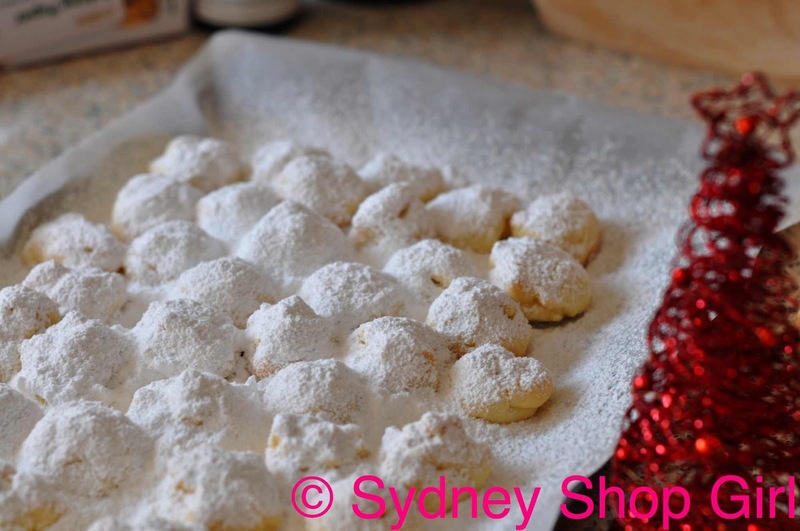 My favourite step was coating the baked cookies in icing sugar. Firstly with a dusting of icing sugar on a baking paper lined tray. 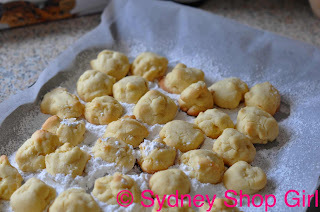 And then a dusting of icing sugar over the top of the cookies on their bed of icing sugar. As close to snow as I'm going to be this Christmas. I found these great tins at Ikea the other week. I'm in the process of baking for Perth. Apparently Melting Moments keep well and I hope they survive the flight home. I'm planning to make Rum Balls later this week. Isn't the week before Christmas magic? It's perfectly acceptable to be baking during (and drinking) during the week. I hope your Christmas plans are going well. I'm just settling in to read for the evening. I've just watched the news and have been inspired by Kate Middleton's hair. I think I may be able to find 10 extra minutes in the morning to curl the ends of my hair with my straightener. SSG, the melting moments look fantastic in the Ikea tins! Any chance you'd be able to share the recipe? TheStylishShoeGirl: No problem, I've linked it to the post. If you click on the Melting Moments red text. 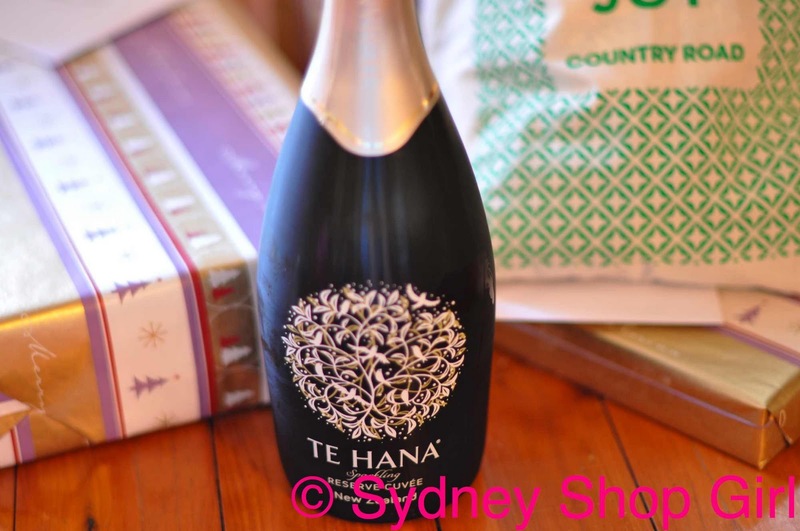 Oooh - I love the sparkling bottle. So pretty. Was it nice or should I buy it for the label alone? I have tried to curl my hair with my straightener. It is deceptively hard. (Or I am just hopeless). I used to love Shane Warne. Pre text messaging and social networking. In his Just Jeans modelling days. I once sent him a wedding present - a photo frame with a picture of me inside. Just to clarify, now I am not jealous of any of his dalliances with various women. Nope. Please don't love me any less because of my previous love for Warnie. Your melting moments look great. Merry Christmas SSG. I am a long time lurker who thoroughly enjoys your blog! Your melting moments look delish, I have not had any in years, if we only lived closer we could have a coffee catch up and a melting moment! Melting moments and bubbly sound like a sweet treat! When I read the title of this post I thought perhaps you had had a dusting of snow...and that would be most unlikely...it's just that so many bloggers are experiencing the white winter wonderlands. I think you are wise to mingle rest with work...I lazed in bed yesterday foe a bit before getting my errands done...almost ready for the family festivities. So many of my favourite things in one post. Not that Shane Warne is one of them, I hasten to add. AFW: if I get any the wiser with a hair straightener as curler, I will devote a post to it!! Semi Expat: have fun! Will be a great venue for people watching. Anonymous: thank you so much for posting. Glad you enjoy the blog. Merry Christmas. Nic: wish we could meet up! You know what, when you hold your baby in your arms, the only way you'll remember these difficult times is from your blog. 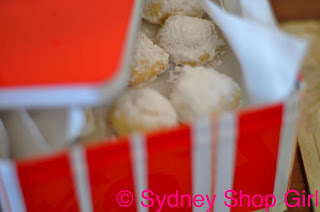 Hostess: I am living vicariously through your blog and others for white Christmas moments. I've been baking and making as well and have to agree that it's lovely to be able to create and sip the bubbles mid-week, all in aid of getting in the spirit. I made a big batch of eggnog a couple of weeks ago and got quite festive whilst I put up the Christmas tree, 'twas lovely. That bottle design is so Christmas chic! Hehe I shouldn't choose wine based on the bottle alone should I?